♥ I Love Lucy DigiArt Designs ♥: Seven Seas Gimp Tutorial with 4x Designs Exclusive from Pimpin PSPers! Seven Seas Gimp Tutorial with 4x Designs Exclusive from Pimpin PSPers! For this tag, you'll want to use my PTU kit called Seven Seas, which can be found HERE. And your tube of choice. I am using the tube "Jessica," an exclusive commission that can be found ONLY at Pimpin' PSPers by the very talented 4x Designs! 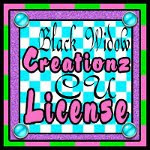 You can find out more info about 4xDesigns and all her creative endeavors here: http://fourxdesigns.blogspot.com/ To use her art, you must have a license number provided to you by the place in which you've purchased the art. 1. Open up the template. Remove copyright layer. 2. FILE>OPEN AS LAYERS paper 13 from the kit. Right click and ADD ALPHA CHANNEL (you will need to do this with EVERY paper layer you add to the tag)... Resize by right clicking and choosing SCALE LAYER to 500 x 500. Position this paper over the grey circle 1 layer of template. Duplicate and flip the copy of the paper. Position this layer above grey circle 2 of template. Then merge by right clicking and choosing merge down- both paper 13 layers. Merge both grey circle layers of template. Right click on the merged circle layer of template and choose ALPHA TO SELECTION then click on paper layer in the layers box to make it the active layer. Go to SELECT>INVERT and then EDIT>CLEAR so that the paper is now only covering the template layer. Drag the grey circle template layer above the paper layer and right click- choose ALPHA TO SELECTION then SELECT>SHRINK by 8 and then EDIT>CLEAR. Add noise- go to FILTERS>NOISE>RGB NOISE and choose the correlated setting and 20/20/20/0 then add a drop shadow by going to FILTERS>LIGHT AND SHADOW and drop shadow with settings at 3/3/3 and opacity at 80. 3. FILE>OPEN AS LAYERS paper 11 from kit. 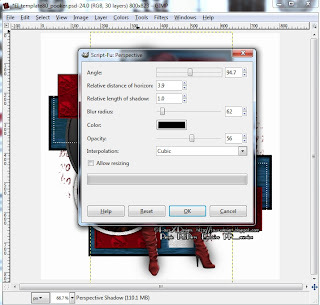 Then you will want to use the fuzzy select (magic wand) tool to select the Red Rectangles of the template. Just click the first box then hold shift on your keyboard down and click to make the next selection, etc. Once they're all selected, click on the paper 11 layer in the layers box to make it active and then go to SELECT>INVERT and EDIT>CLEAR. Merge Red Rect 1 and 2 together. Right click ALPHA TO SELECTION, SELECT>SHRINK by 4, EDIT>CLEAR then move above paper 11 layer. Add noise and drop shadow just as described in step 2. Merge Red Rect 3 & 4 together and right click ALPHA TO SELECTION, SELECT>SHRINK by 4, EDIT>CLEAR then move above paper 11 layer. Add noise but change the drop shadow settings to -3/-3/3. 4. FILE>OPEN AS LAYERS paper 12 and resize to 400x400. Position above white strio 2 in template then duplicate the paper layer and position the copy of the paper above white strip 1 in template. Merge the two white strips layer of template together. Merge the two paper 12 layers together. Right click on template layer and choose ALPHA TO SELECTION then click on paper layer to make it active and go to EDIT>CLEAR. Delete the merged white strip template layer since now the paper is replacing it... Add a drop shadow with settings at -3/-3/1- and choose white as the color. Then add noise to the drop shadow. 5. FILE>OPEN AS LAYERS paper 7. 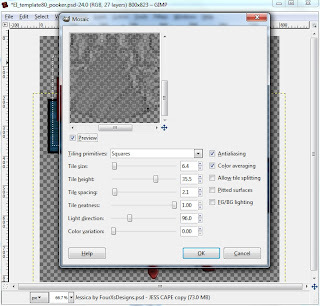 Drag this layer so it is below the black square 1 & 2 layers of template. Duplicate the paper layer and drag the copy of the paper so it is below black rect 1 & 2 in template. Merge black square 1 & 2 layers together. Merge black rect 1 & 2 together. Right click and ALPHA TO SELECTION on the black squares then click on paper layer to make active then SELECT>INVERT and EDIT>CLEAR. Repeat with black rectangles and copy of paper. Next, you will want to ALPHA TO SELECTION the black squares and SELECT>SHRINK by 8, then EDIT>CLEAR. Repeat with black rectangles. 7. Now get the tube you want to use and scale it to an appropriate dimension to fit within the black circles that we just worked with in step 6. 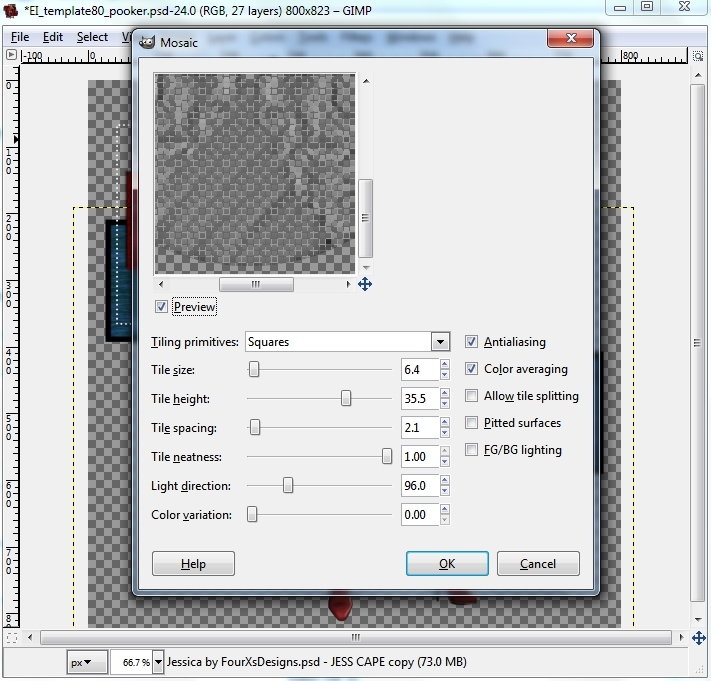 ALPHA TO SELECTION the template layer and SELECT>INVERT and EDIT>CLEAR on tube layer. I went up to COLOR>CURVES and dragged the middle of the line down towards the right bottom corner... then lowered the opacity to 70%- you can do this by clicking and dragging the slider at the top of the layers box. For the middle of this tag, I wanted to really make this tube stand out so I did something a little different. I used the layers with the cape not the hood and set them just right where I thought they'd look good then merged the two together. I went to COLORS>DESATURATE and then right clicked and chose ALPHA TO SELECTION on the red circle of the template, then SELECT>INVERT and EDIT>CLEAR on the merged tube layer. I then right clicked on this layer and ALPHA TO SELECTION and went to FILTERS>DISTORT>MOSAIC and used the settings below. Click the image below to see better. Then click the Mode box at the top of the layers box and choose overlay. 8. OK... this is a very important part of making the tag. When you're using tubes you always want to credit the artist. So add your copyright info- that is the copyright symbol, the artist's name, website and license number, if applicable. 10. Add your name or text to your tag, I used a font called Treasure Map Deadhand. I puffed it out by going to FILTERS>DECOR>ADD BEVEL with setting at 5. When you're finished, just use the rectangle select tool to crop around your tag and go to IMAGE>CROP TO SELECTION. Then save first as .xcf so you can come back and make changes if necessary. When satisfied with the tag, save as .png!